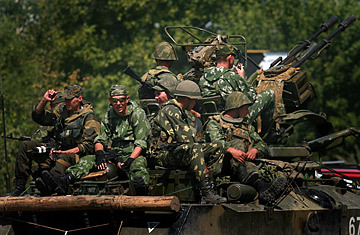 Russian soldiers sit on top of an Armoured Personnel Carrier (APC) at a Russian army position. According to his paperwork, "Dmitri" spent several weeks in a psychiatric institution in the Arkhangelsk region in northern Russia and, soon after, he was finally diagnosed with a mild mental illness. He won't say what the diagnosis actually is; the important thing for him is that the general finding is stamped across his identification papers. It prevents him from ever getting a job in the Russian government. But more importantly for Dmitri, that medical certification prevents him from being drafted into the army. All men between 18 and 27 years of age who meet minimal health requirements must present themselves for compulsory army service. University attendance allows people to be exempted only if the school requires military training in order to graduate. Men who do not serve (and do not have a good reason for being exempted from duty) do not qualify for international passports and related documents issued by the government. It's easy to be caught and summarily sent off to service because government-issued documentation must be carried at all times. "They checked my papers at the metro station in Chisty Prudy," says Alexander (who chose not to give his last name) who was drafted to the navy. "I had waist-length hair. The next day, when I was on the phone to my mother, I was shaved bald and trying to explain to her what was happening, I was with dozens of other boys none of them knew where we were going." Many people go to the International Movement of Soldiers' Mothers to find out how to prevent their children from getting drafted. "For some people it works to register at a different address, or stay at a relative's house when the military inspectors come around," says Tatiana Kuznetsova, who runs the Movement, "We always suggest to go to the doctor" who might then be able to find some physical reason to qualify for exemption from service. Boris Titov, a human-rights activist, told radio station Ekho Moskva that young Russians who can afford to should be allowed to pay their way out of service  provided that the money goes towards improving army conditions in Russia, which are notoriously low. Others, however, point out that may only exacerbate class divisions and affect the quality of the country's soldiery. "The army is already made up of Russia's poor," says Kuznetsova. "With this kind of system, it will be full of alcoholics and invalids." The horrors of service may drive people away but, in the end, demographics may be enough to undermine the Russian draft. This generation is already small compared to past conscription pools; it is also qualitatively of poorer stock. Says Golts: "Already, half the conscripts are not actually healthy enough to serve." Golts worries about the drafts to come. In the next few years, he says, the situation will become worse because of the poor birth rates of the 1990s. "I am not sure what the army will do to maintain the quota." Cast your vote for the TIME 100. See 10 things to do in London.